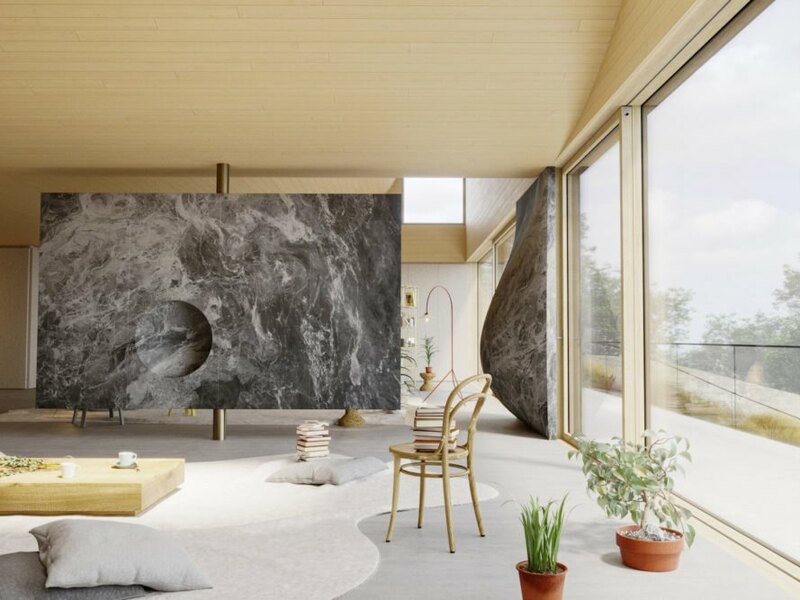 Cambridge-based design studio WOJR has proposed an unusual Silicon Valley home that stands out from the pack with its swooping rooflines and sculptural appearance both inside and out. 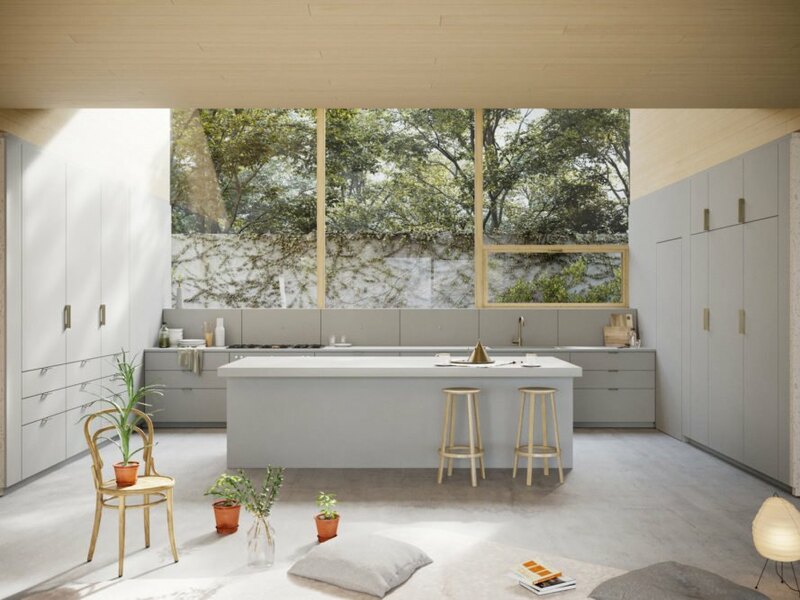 Located in Los Altos, the House of Horns will be built on top of an existing foundation originally intended for an “elaborate Spanish style home.” In contrast to the former proposed designs, the new dwelling embraces minimalism with clean lines and a restrained neutral palette. Though the project has yet to be built, WOJR’s impressive renderings reach a level of photorealism that could easily fool the unknowing eye. 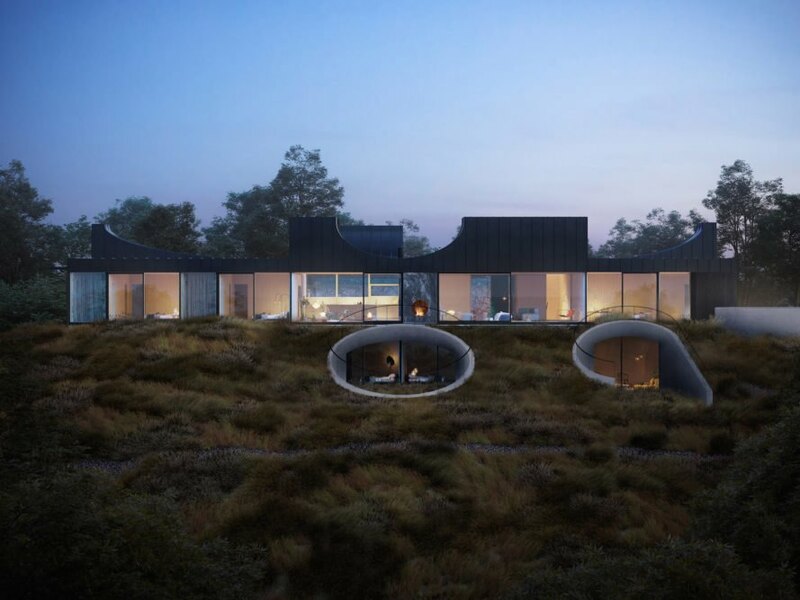 The 8,500-square-foot home will be wrapped in black timber and topped by a sculptural metal roof that curves upwards in multiple directions, giving rise to the home’s name House of Horns. Ample glazing, from the skylights to the clerestories on the “horns,” ushers in natural light. In contrast to the exterior, the rooms are lined in light colored wood, pale concrete floors, and marble partitions. Full-height glazing frames views of greenery and the dips and swells of the roofline are expressed in the ceilings. On the ground level, communal areas are placed in the center of the building and flanked by bedrooms and bathrooms. The basement level below ground will also enjoy access to the outdoors with hobbit-like circular openings that open up to small courtyards. Construction on House of Horns is scheduled to begin this summer. Though the project has yet to be built, WOJR’s impressive renderings reach a level of photorealism that could easily fool the unknowing eye. Ample glazing, from the skylights to the clerestories on the “horns,” ushers in natural light. 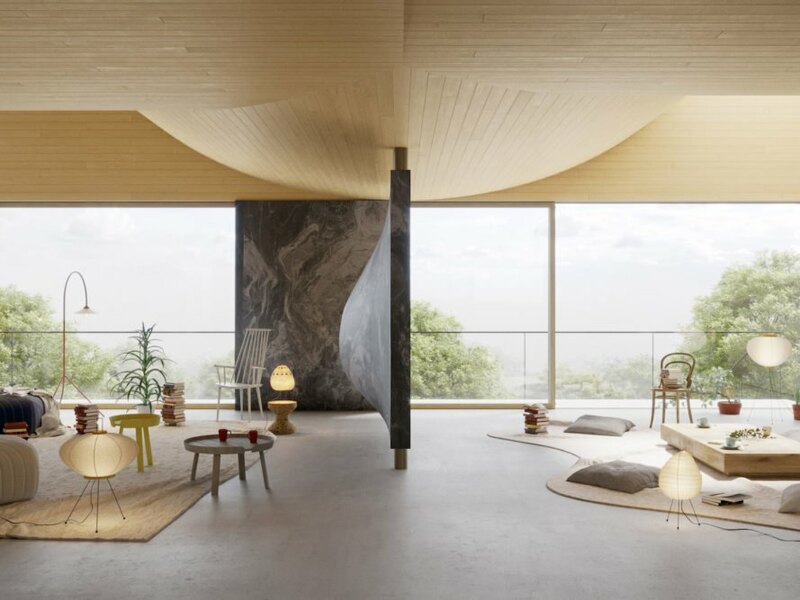 In contrast to the exterior, the rooms are lined in light colored wood, pale concrete floors, and marble partitions. Full-height glazing frames views of greenery and the dips and swells of the roofline are expressed in the ceilings. The basement level below ground will also enjoy access to the outdoors with hobbit-like circular openings that open up to small courtyards.